The Rongbuk Monastery is located at the northern foot of Mt. Everest. The monastery was originally built in 1902 by a Nyingmapa Lama. The area where Rongbuk Monastery was built that had been used by monks and hermits for meditation for over 400 years. 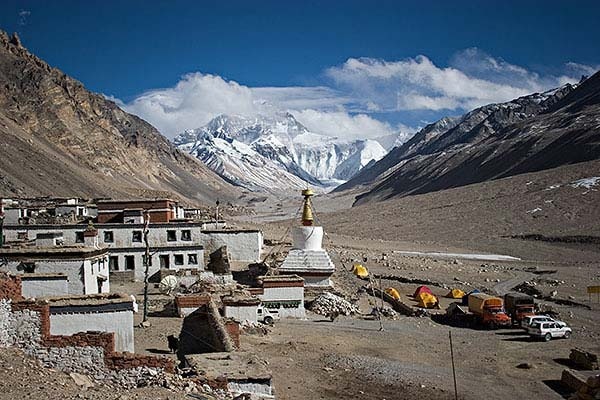 The monastery is located 5,000 meters above sea level near the north side base camp of Mount Everest, making it the highest monastery in the world. It is a monastery of the Nyingma sect of Buddhism. It now houses about thirty monks and nuns, but in the past it housed as many as 500. Hermitage meditation caves dot the cliffs around the monastery, and many stones carved with prayers and sacred symbols line the paths to them. 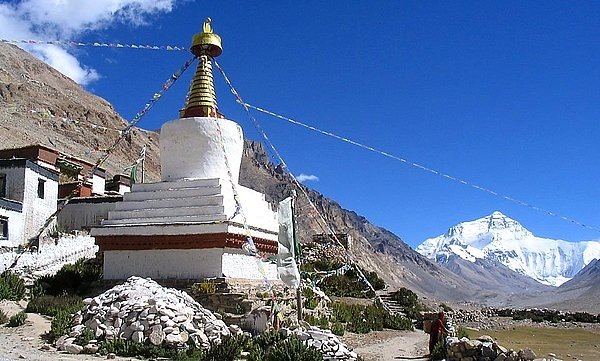 Besides the Tibet Entry Permit, you must further apply for Alien Trable Permit, which is issued by the Local Public Security Bureau(PSB) of Tibet to travel Mt. Everest area. The best season to go is the periods between April and May, along with early September and late October, among which less than 20 days are actually fine. So keep a very close eye on the weather changes there if you want to climb. It is about 8 km. (4.97 mi.) to the Everest Base Camp and a good point to appreciate the scenery there at dawn and dark. There is a hostel in Rongbuk with 100 beds, a dinning room and a store, where tourists and mountaineers may have cooked food and instant food, even beer. 300 meters (980 feet) south of the monastery is the famous Rongbuk Glacier. A distance of 10 kilometers (6 miles) lies between the monastery and Everest Base Camp. 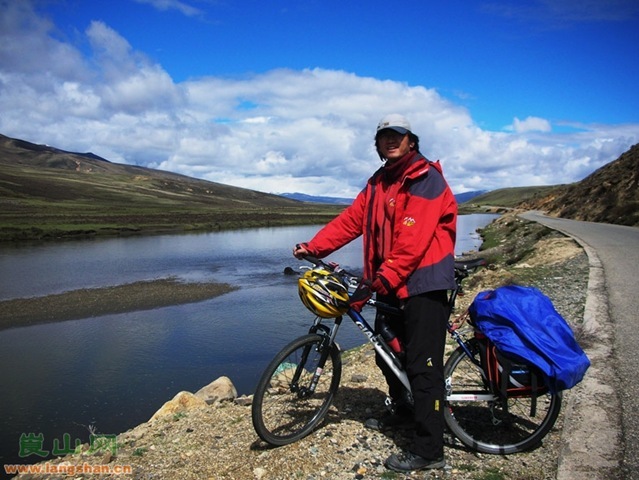 Tibet, this stands at the top of the world in the city, the average elevation of four thousand meters above the snowy plateau gestated from generation to generation of the Tibetan people, they love this piece of land, they use their enthusiasm in this land, carry forward. 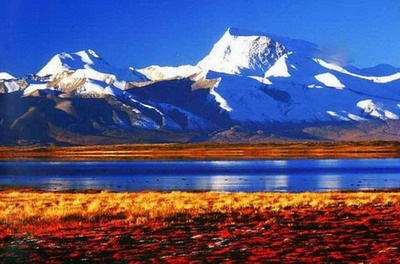 If you want to come here to travel, it must first look at the culture of Tibet, this will provide you travel help. Talking about Tibet’s culture, it should be from the Tibet festivals. Tibetan is one of the many festivals, it is said that this year have greatly small 100 Festival. In the every kind of festival contains different meaning. We have to say that the Tibetan New Year. The Tibetan beginning in January 1st, Tibet is the most solemn holiday; there is the Lantern Festival, the lunar January fifteen people light a lot of butter lamp, lamp holder, and build a lighthouse, also with the butter sculpture painting and various patterns, is very good! Besides these there are some Tibetan people must celebrate the holiday, which I have no one one was introduced, which you have come here to experience will have the feeling. Tibet is a mysterious place, its quiet its sanctity, the dream of everyone here will be pure, here is the Tibet, a let you cherished place, your every act and every move can let Buddha discerned, your heart here by the pious washing, your everything about life disruption and not be understood become meaningless, you in here, don’t think of sad thing, the scenery here in heaven with you around, your physical and mental Piaoyang, you all here quietly hide, to look at the mysterious and profound. 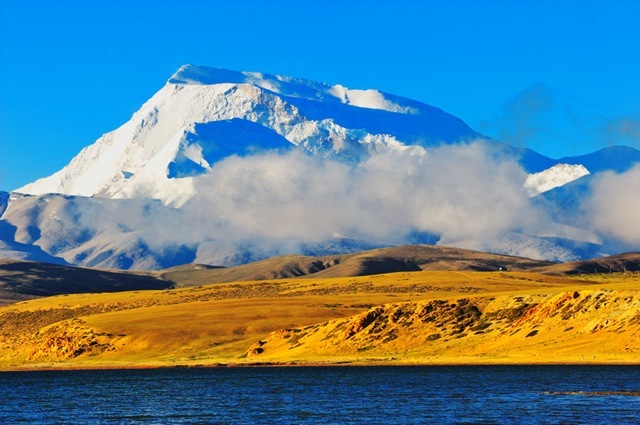 Naimona’nyi Peak stands by Lake Manasarovar. It has an altitude of 7694 meters. It is the fifth highest mountain among the five Goddess Mountains of Himalayas. 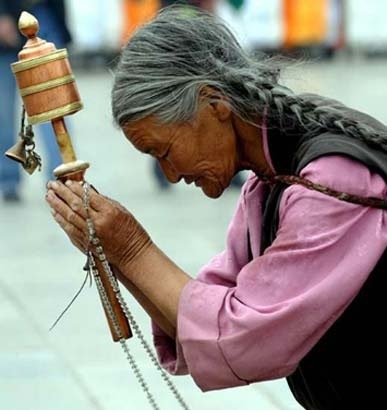 It is regarded as a holy mountain which controls the intelligence and life span by Tibetans. Naimona’nyi Peak has six main mountain ridges and there are dozens of mountains with an altitude of more than 6000 meters on these ridges. The cliffs here are pretty precipitous and there is an arête with a height difference of 2000 meters on the east side of Naimona’nyi Peak. There are five magnificent giant glaciers w on the west of the peak. Naimona’nyi Peak was opened as a mountaineering region and scientific research area in 1980s. The geologic investigation and some mountaineering activities organized by Sino-foreign joint mountaineering team were held here. In 1985, the Sino-Japan Joint Mountaineering Team conquered Naimona’nyi Peak successfully.